* Chipboard or Strong card * Fancy paper for front and back * Coloured card for pages * Paper to print dates onto * Alphabet Stamps (or a die cutting set, Stickers, chipboard, anything really!) * Binder or book rings * Extra bits from your crafting stash! * Create, print and cut out 5 1/2 inch squares containing the dates for each month. - I left off the first letter of the month so I could add a decorative one. I also created a notes page for each month. * Out of the chipboard and fancy papers cut two 6 x 6 inch squares. 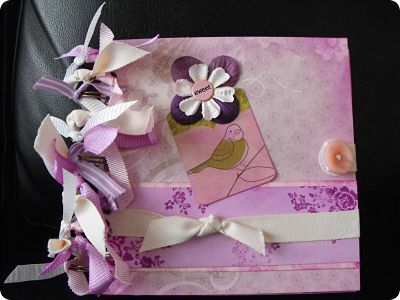 * Cover one side of each of the chipboard squares with the fancy paper and decorate them if you want. - For mine I distressed the edges using a Tim Holtz blending tool, added some ribbon and emblishments form my crafty stash. I also decided to add a fastening by attaching a ribbon to the back page with a eyelet and a brad, and sewing on a button to the other end. I then stuck on a velcro dot to the button and the front page. * Next, stamp the first letter of all the months and notes pages onto the fancy paper. * Cut the coloured card into 6 x 6 inch squares to create your pages - I enhanced the pages by stamping and distressing them. * Stick your printed months onto your coloured card. 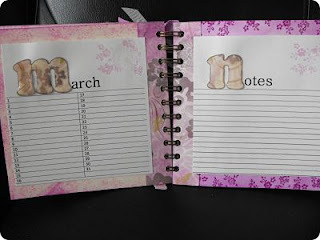 * Glue the first letter of each month onto the page and then gloss them.